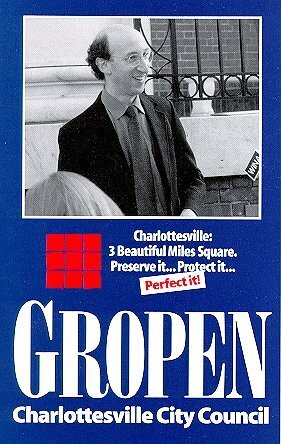 Candidate for the Democratic Nomination for Charlottesville City Council in 1998 (Palm Card authorized by N.H. Gropen for Future Thinking Council). "Touting himself as the 'fresh guy in the party,' Democrat Neal Gropen on Friday announced his candidacy for the Charlottesville City Council, joining (Blake Caravati and David Toscano) who have expressed their intentions for a seat" (Kimberly O'Brien, The Daily Progress, January 17, 1998). "Gropen said he opposes reversion, but is willing to listen to arguments in favor of it. 'I'm not sold on reversion,' he said. 'If it's in the best interest of the city, I will get out of the way. I will help it. ... But loss of independence is no small thing" (Kimberly O'Brien, The Daily Progress, January 17, 1998). He does not favor reversion as a means (1) to consolidate government services, (2) to facilitate trust or (3) to foster combined planning (N.H. Gropen for Future Thinking Council, 1998). He has not, however, ruled out the reversion process. He would also "move to stop construction and ask the council to study (Meadowcreek) parkway" (Kimberly O'Brien, The Daily Progress, February 15, 1998).